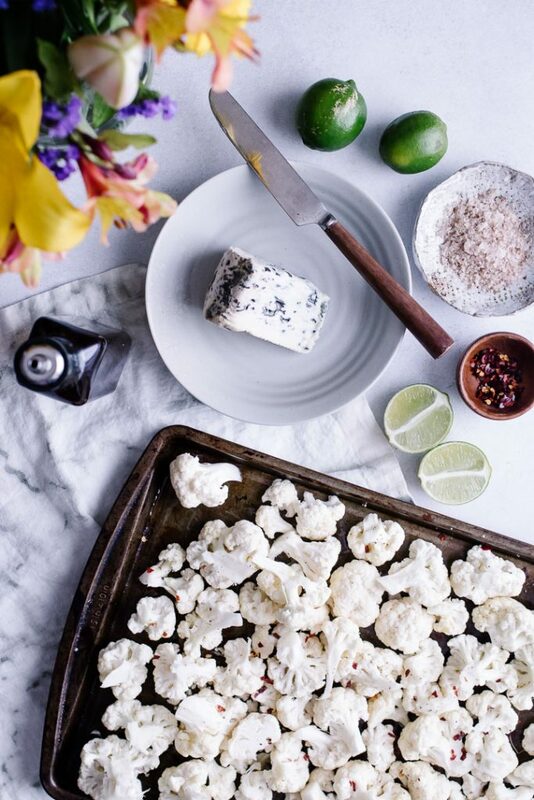 Gorgonzola-Lime Roasted Cauliflower, a simple 3-ingredient oven-baked cauliflower recipe topped with bold gorgonzola and a squeeze of lime. Super simple ingredients, big bold flavor! You probably read that title and thought, “What? 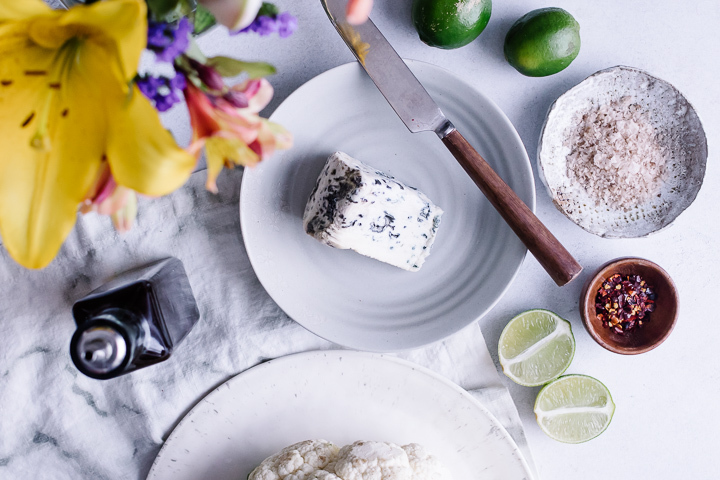 Gorgonzola and lime?,” because that’s exactly what I thought too…until I tried it. This recipe, like many odd yet delicious food combinations, was born out of necessity. It was cleaning day in my house and I had been scrubbing floors for hours and realized I was famished. I opened the fridge to find that it would also be a grocery day, because there was next to nothing to eat. On the verge of hangry I roasted cauliflower in the oven, crumbled gorgonzola on top, and squeezed a bit of lime for good measure. And guess what? It was a seriously flavorful take on an otherwise boring vegetable dish (love ya cauliflower, but let’s be honest, you’re not that exciting on your own). The moral to the story? When you’re down to a few ingredients sometimes you have to get creative with combinations and be open to the fact that it might not be a hit. That’s the fun of cooking: experimenting to create a dish that is more than the sum of its parts. Don’t be afraid to test random flavor and ingredient combinations, you never know what the outcome may be. Some of the best creations start as experiments! So let’s get to it. Roasted Gorgonzola Lime Cauliflower, simple 3-ingredient recipe that is low on prep but high on flavor! The theme here at Fork in the Road is super simple recipes made from inspired superfood ingredients, and this recipe truly is the epitome of easy. Three ingredients, 30 minutes, and lots of strong flavors–exactly my kind of dish! Cut a head of fresh cauliflower into small florets, toss with olive oil, and salt and pepper. Roast on a baking sheet until golden brown. Then plate and top with crumbled gorgonzola or blue cheese and a squeeze of fresh lime. That’s it! This may be the simplest recipe on Fork in the Road and it doesn’t skimp on flavor. This simple oven roasted cauliflower does not require much but below are a few simple tips for making this already simple recipe even easier. Skip the cauliflower crumble mess! I realized recently that I’ve actually been cutting cauliflower wrong my entire life. I always loved to make it but hated the mess of white crumbles left over after cutting a cauliflower head. Well, cauliflower crumble no more, this simple new-to-me trick makes cleanup much, much easier. Tools: this recipe is about as low maintenance as it gets, but there are a few kitchen tools that make preparation easier. First, a good set of good quality glass mixing bowls is essential to hold and mix cauliflower without spilling half on the floor and a good quality knife set makes cooking all around easier (and they’re safer for your fingers than dull knives). Craving more simple yet flavorful vegetable recipes? Check out our Roasted Beet Fries and Honey-Glazed Carrots with Carrot Top Chimichurri recipes, both easy vegetable side dishes that don’t sacrifice flavor. 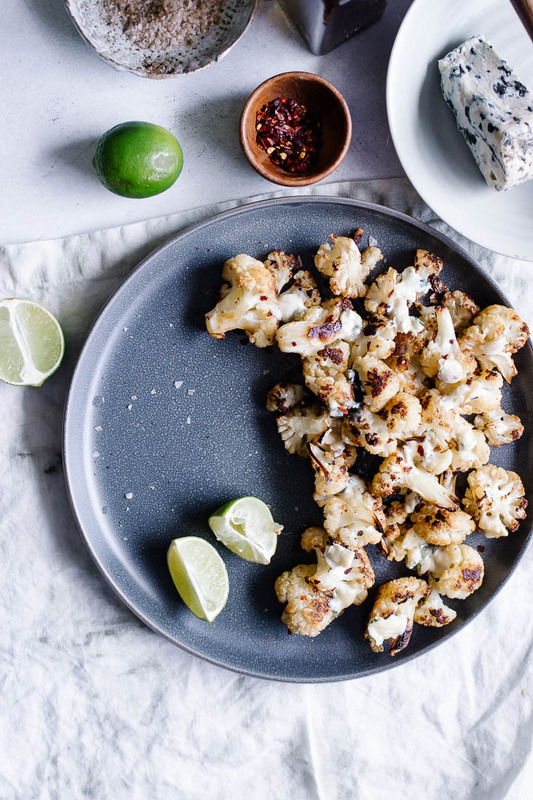 Did you make this Gorgonzola-Lime Roasted Cauliflower? Leave a comment below and rate the recipe to let us know how it turned out. 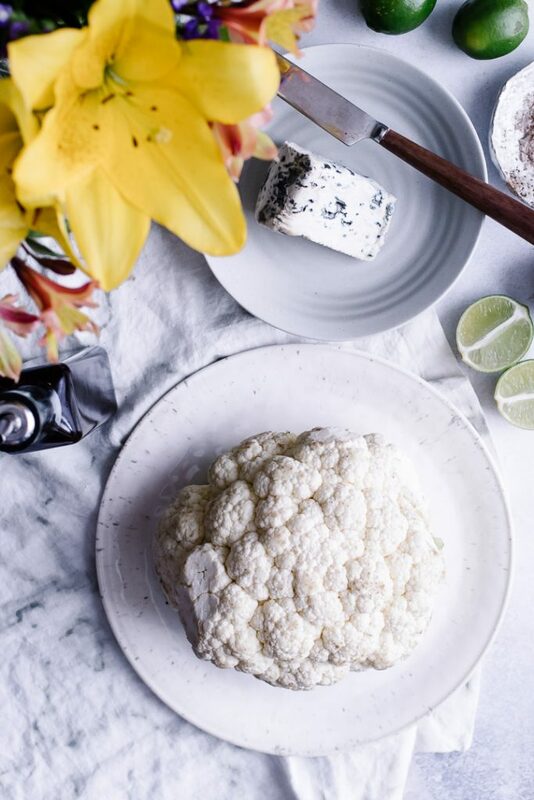 Save this recipe for later by pinning to your favorite vegetable side dish Pinterest board and make sure to tag me on Fork in the Road’s Instagram to show me your cheesy cauliflower creations! 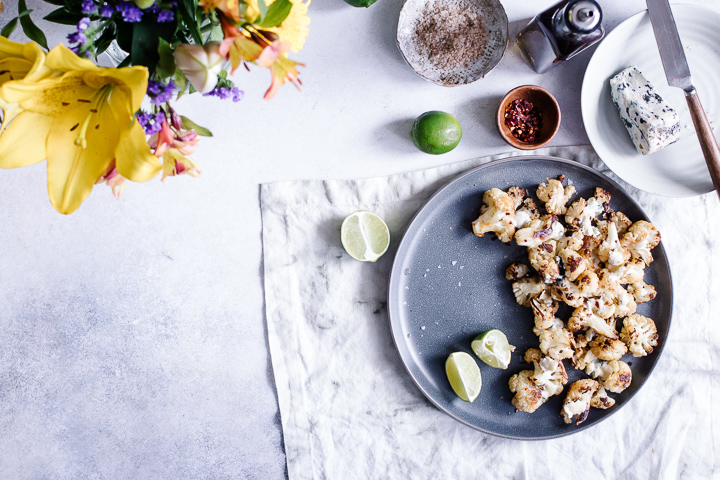 Gorgonzola-Lime Roasted Cauliflower, a simple 3-ingredient oven-baked cauliflower recipe topped with bold gorgonzola and a squeeze of lime. Preheat oven to 425 degrees F (~220 C). Cut cauliflower florets from head, separating into small pieces Add to a large glass mixing bowl and drizzle with olive oil. Add pinch of salt, pepper and chili flakes and stir to combine. Roast cauliflower on cookie sheet for 25-30 minutes. To achieve max flavor, let cauliflower brown on pan without moving for 15 minutes before flipping. When cauliflower has browned on all sides, remove and plate. Sprinkle crumbled gorgonzola and a squeeze of lime over the top and serve immediately. Enjoy! Don’t add too much salt when roasting. Gorgonzola is naturally a very salty cheese so go light and then add more if needed once you’ve added cheese. Leftovers and Storage: Store in an airtight containers in a refrigerator for up to five days and reheat in microwave or in a pan over medium-low heat (this will also be good cold and can be a great salad topper). Nutrition: This simple roasted cauliflower recipe is an excellent source of vitamin C, provides 5 grams of fiber, and 8 grams of protein. It’s great as a side dish or double up the serving for a simple main course on buy weeknights. 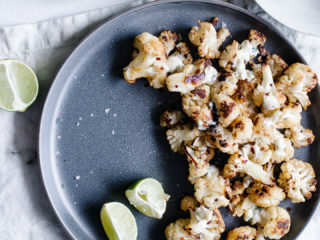 I love roasted cauliflower and this looks like a great variation, I’ll definitely have to try. Can I use any type of cheese? Yes, any type of cheese will do. I personally like the pungent taste of blue cheese and it melts well on the cauliflower, but any cheese will work well. Enjoy!